Want to hear some amazing ghost stories and learn more about Tonopah’s haunted history? Join us for one of our Ghost Walks! We offer them twice per year, in the spring and in the fall. Visit several haunted locations, including the Clown Motel, Old Tonopah Cemetery, Mizpah Hotel, Tonopah Historic Mining Park Visitor’s Center, Mizpah Mine Shaft, Bella’s Kountry Korner, and the Tonopah Liquor Company. Based on over 400 hours of historic research and interviews, these ghost stories and the history behind them are the real deal. 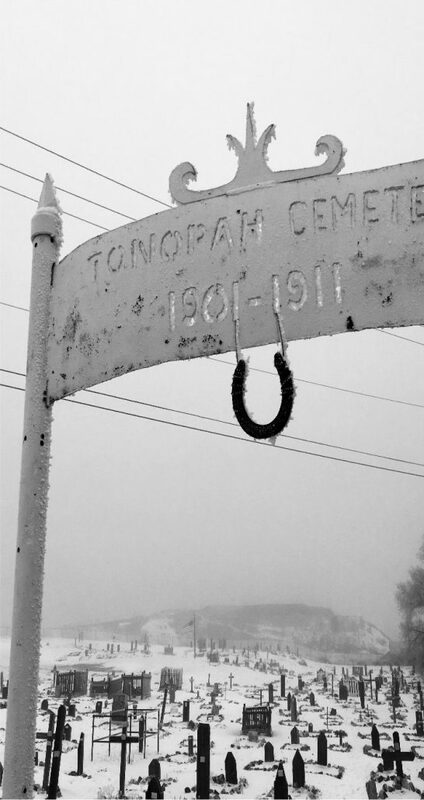 Want to get a tour of the Old Tonopah Cemetery in the dark from someone who knows every inch of it, and hear many more stories that aren’t in the walking tour? Want to hear the full story of Bina Verrault, including how it was discovered that she is the one haunting the Visitor’s Center at the Tonopah Historic Mining Park? Want to hear what really happened to the Lady in Red, and see exactly where she died? Do you want to know what tricks George “Devil” Davis plays on the owners of the TLC? Take one of our Ghost Walks! Who knows, you might even have an encounter of your own!